These are the words of South Bend, Indiana mayor and Democratic presidential candidate, Pete Buttigieg at the LGBTQ Victory Fund National Campaign Brunch earlier this month. Inaccurate and cringeworthy as his words are, that they’re being said aloud isn’t likely to shock us anymore. Skimming through popular news sites for only a few minutes this morning, I saw multiple and equally ridiculous statements in articles titled, “Buttigieg is a symbol for a rising Christian left” and “Christianity’s future looks more like Lady Gaga than Mike Pence.” I hopped offline after that last one. The thinking behind these articles and behind all of those that have embraced the “progressive Christian” worldview is becoming more and more popular in our culture. It’s not uncommon at all to see someone profess to be a Christian while simultaneously holding on to beliefs and practices that contradict Christianity entirely, both in and outside of Hollywood. We treat religion like a salad bar; we pick and choose what we like and leave behind what we don’t care for. The problem with this type of religion is that it’s dead. That’s not a fundy opinion — that’s what the God of the Bible says about it. “For as the body apart from the spirit is dead, so also faith apart from works is dead,” reads James 2:26. If we say that we know Him, but walk in darkness, we’re lying and we aren’t practicing the truth. That’s 1 John 1:6. Christianity isn’t a label that one can add on as an extra credential for marketing. To be a Christian is to love and obey God (John 14:15). Although it may be more in-your-face today thanks to the internet and social media, this distorting of God’s truth isn’t new. From the very beginning, mankind has been guilty of twisting what God has said in favor of what we’d prefer He say. The very first sin man committed was because the serpent approached Eve with, “Did God really say..?” It’s eerie, but also not surprising, that the same tactics are being used by him today to deceive so many. That’s why the Bible is packed with exhortations to actually live out your faith and even to “examine yourselves to see if you are in the faith” (2 Corinthians 13:5). We are so prone to attempt to make God into our own image to suit what we want. We allow our hearts and not Scripture to inform our beliefs and the consequences are deadly. God warns us against leaning on our own understanding (Proverbs 3:5) and about how deceitful our hearts are (Jeremiah 17:9). All of these truths and more wisdom were given to us in the Bible; unfortunately, many who claim Christianity aren’t actually reading it, so it’s not doing them any good. It would appear that the authors of the articles mentioned above believe that the “older Christian ideas” are being upheld by old-school thinkers and not by any objective standard. They think that people like Pence or others who hold fast to traditional values as expressed in Scripture are standing in the way of a new and “better” wave of Christianity. The problem comes down to authority. Who determines what true Christianity is? Is it relative and ever-evolving like our world is, or is it absolute and based on an unchanging, inerrant document from a perfect God? Christians have long been known as “people of the Book.” We see that Jesus esteemed Scripture very highly, and as in all other ways, we are to follow His example. When refuting Satan in the temptation in the desert and when answering the various objections of the Pharisees, He went straight to the best source given to us for truth: the Scriptures. He based His life and ministry on its teaching and exhorted His followers to do so as well. After His ascension, His apostles wrote letters to the early churches, often citing passages from the Old Testament, instructing Christ’s people how to live. Scripture is intended to be “a lamp unto our feet, and a light unto our path.” When we forsake it, we will inevitably stray away from God and toward sin. We have no reason for assurance that we are in the faith when we abandon His Word and how He says we are to live. The Bible explicitly says that these sins are bad for us and will not do us good. Buttigieg is in the same condition that all people live apart from Christ. He’s a slave to sin and needs a new heart in order to love his Creator more than he loves his sin. God didn’t cause Buttigieg’s homosexuality — the fall of Adam and Eve corrupted all of us with sin. 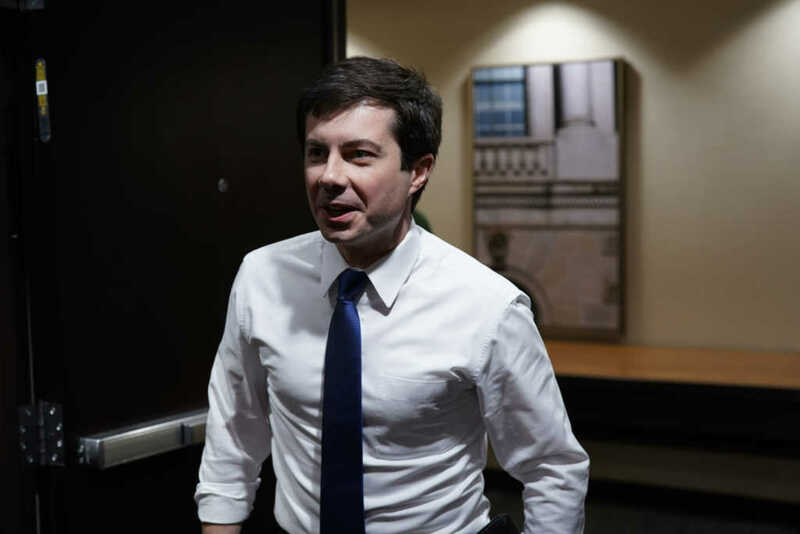 Buttigieg is embracing his sin rather than obeying Christ with his heart and body. Our sinful desires vary from person to person, but the remedy is the same for all: Christ’s atonement and the new birth that brings about new life. Wrong again, Mr. Buttigieg. We see, from Scripture, that our sin separates us from God (Isaiah 59:2). Again, it’s clear that the mayor doesn’t understand who God truly is, and what a huge problem our sin really is. Sin is something that God hates and it’s serious enough to warrant Christ coming and dying for any of us to be forgiven for it. It does the opposite of what Buttigieg claims it has done for him. This may be the one part that he has almost right: we don’t quarrel with those who are lost and are trying to justify their sin. Ephesians 6:12 tells us that it’s not flesh and blood that we wrestle with but against rulers, authorities, and cosmic powers over this present darkness. We fight against the spiritual forces of evil, not those who are being held by them. I’m not writing to win any argument against Buttigieg or anyone else who’s still blinded by the “god of this world” (2 Corinthians 4:4). My aim is to point us back to the only true source of authority we have. As Christians, our role is to stand firm and declare that God’s Word is truth, and that the meaning is plain: homosexual activity is a sin, and by choosing to embrace that sin, or any sin, you are choosing to reject Jesus as Lord simultaneously. We cannot have both. Our God is a jealous God; He will not share us with that which He hates. What Buttigieg needs is a new heart that loves God more than the sins his flesh is drawn toward. Homosexuality isn’t what will ultimately keep Pete Buttigieg from God. His rejecting God’s Word and instead being his own god is his greatest problem. The politician claims to believe in God, but when God actually speaks — about homosexuality, for example — we see that he believes firstly in himself and what he thinks is most right. Those who are without Christ and are living in sin are hostile to God, even if they’re not aware that they are (Romans 8:7). When Christians cite His Word, lost people are offended. It’s not Mike Pence or Christians that they’re at war with — their quarrel is with God. We can rest assured that if we’re faithful, God will use our words, and that if people hate us for them, we’re in good company. “If the world hates you, know that it has hated me before it hated you,” reads John 15:18. Christians, don’t let someone’s claim of righteousness be your standard for what is right. Open your Bible. Believe His word. That is your guide and your only truth. Pray for Pete Buttigieg. I write this for his sake and for all those who are claiming Christ but living in ways that contradict Him. They’re doing harm not only to themselves but to those who are trusting what they’re hearing rather than looking at the Scriptures for themselves. Those who choose to ignore the Bible in favor of popular opinion will be without excuse. No one will be able to tell the Judge of all the universe that His Word was wrong, and that Lady Gaga or whoever else had more wisdom and goodness than the King of Kings. If you’ve found yourself guilty of leaning on the understanding of another sinner and not what God has said, repent today. Confess your sin, open the Bible, and obey your Creator. Cling to Christ, and believe that He is worthy. He is better than any sin or any person with whom you’re sinning. His love is greater than all of it.